Even when stray light sources do not illuminate the optics directly, they can still scatter from structure or baffles and then illuminate the optics. While this is always smaller than direct scatter it may be large enough to be of concern. 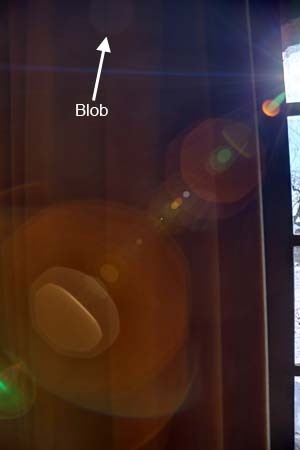 The sun and the window are at the right of the image but they were shining (in the object space) from the upper side of the camera (i.e. the flash "hot-shoe" side). 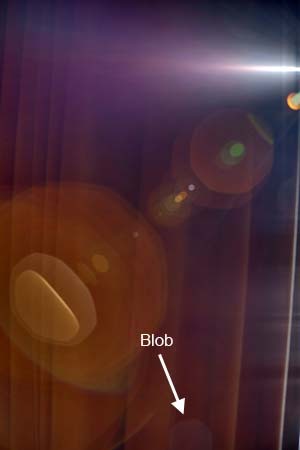 The result is a round and faint artifact (a blob) that is the image of the dust speck after recording it on the sensor. The flare artifact is near focus (the lens was set at 0.7 meter and f/5.6) yet very slightly scattered after refraction through all the lens elements before hitting the CMOS. There is here no long rainbow colored streaks of light that often go with this type of flare effect when the aperture of the lens is closed down to smaller opening (e.g. f/11 or more). It is very hard to see these faint ghost images in the viewfinder. The sun were here shining from the underside of the camera. A tiny speck of dust was on the front surface of the lens, the same as above at the same place. But because the camera has been put upside-down, the blob is now on the bottom of the image, symmetrically aligned about the center to the precedent position. There is here no long rainbow colored streaks of light caused by diffraction from the contamination element that often go with this type of flare effect when the aperture of the lens is closed down to smaller opening (f/11 or more).